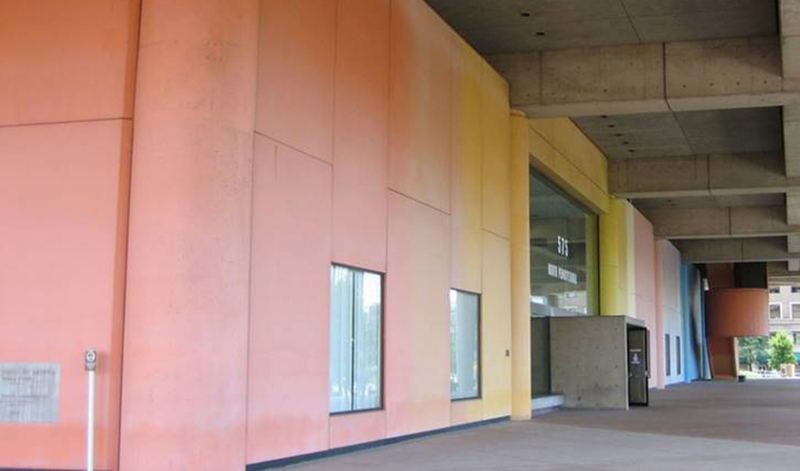 A 2012 renovation of Indianapolis’s Minton-Capehart Federal Building recaptured some of the Brutalist icon’s most distinctive features. Of all the styles of modern architecture, few elicit such strong reactions as Brutalism. The name comes from béton brut, French for “raw concrete,” the style’s primary building material. Rough, unadorned, massive forms define Brutalism, favored for institutional buildings from the 1950s to 1970s. While some see Brutalist buildings as cold, hulking and brutal, the style has gained a following among Modernist aficionados. 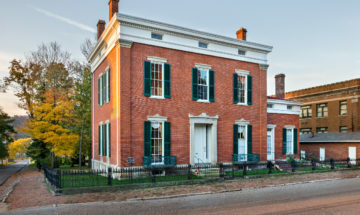 Defenders cite its geometric shapes, sturdy forms, unpretentious nature, and weathered look, which can make the buildings popular subjects for photographers and Instagrammers. 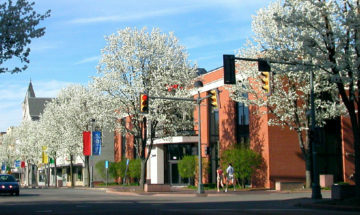 1974-75 on Pennsylvania Street east of the Indianapolis War Memorial Plaza, the six-story building spans a full city block. Woollen took inspiration from the ziggurated profile of the Indiana War Memorial nearby, but inverted the stepped design, with each floor taking up a little more space than the floor below it. The use of concrete as the primary building material conveyed the permanency of the federal government. 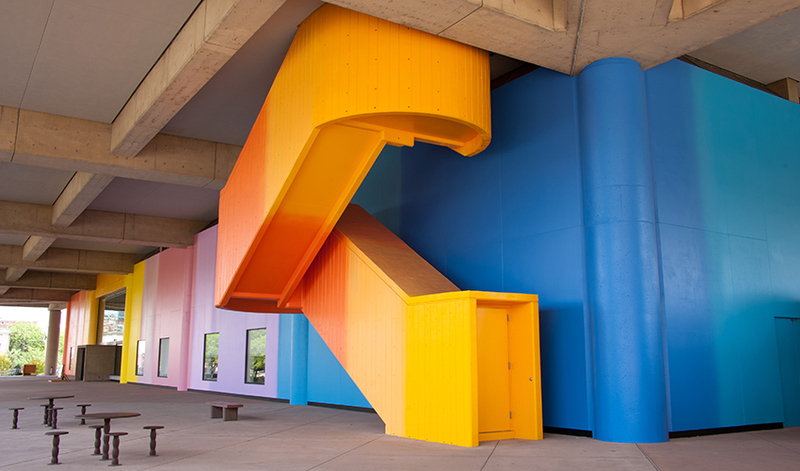 The U.S. General Services Administration’s Art in Architecture program hired graphic artist Milton Glaser, famous for originating the “I ♥ NY” logo, to create a mural on the building at street level. Measuring 672-feet long and 27-feet high and wrapping the entire lower level, Glaser’s Color Fuses featured 35 blended bands of color, augmented by programmed lights that moved a band of light gradually across the mural at night, simulating the rise and fall of the sun. Glaser’s vision for Color Fuses faced challenges from the start. The prescribed lighting system didn’t work properly and was replaced early on with fixed lighting. 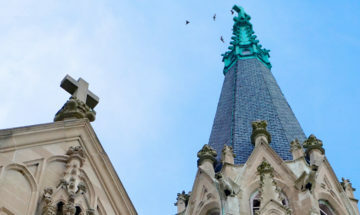 By the 2000s, Color Fuses had almost faded out of existence, its colors eroded by decades of weather, its surface damaged by graffiti, yellowed varnish, dirt and grime. 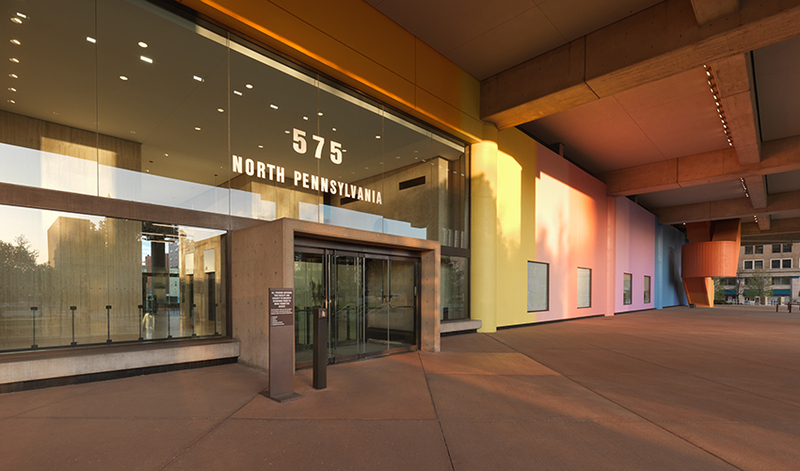 From 2009-2012, the U.S. General Services Administration (GSA) undertook a renovation that modernized building systems, the first major infrastructure upgrade since the building’s construction, and seized the opportunity to restore the mural and illuminate the architecture. 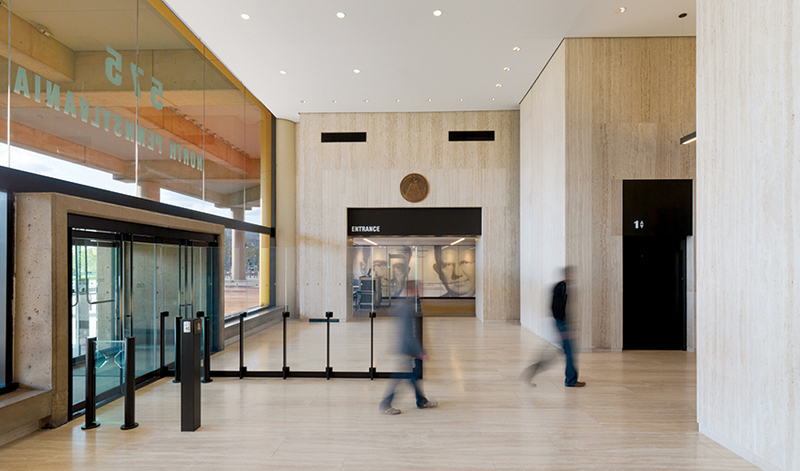 Recognizing the building’s Modernist pedigree, the GSA consulted internal documents that had identified key architectural elements of the building that should be maintained, while implementing modern systems that allowed the project to achieve a LEED Silver certification. 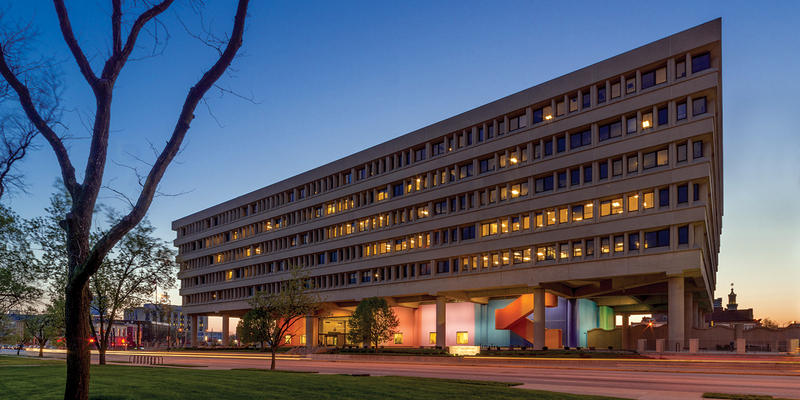 The 2012 renovation of Indianapolis’s Minton-Capehart Federal Building restored Milton Glaser’s Color Fuses mural (shown here in its before state) to the original specification, with 35 blended bands of vibrant color and moving light that simulates the rise and fall of the sun. (Photo courtesy of the U.S. General Services Administration). 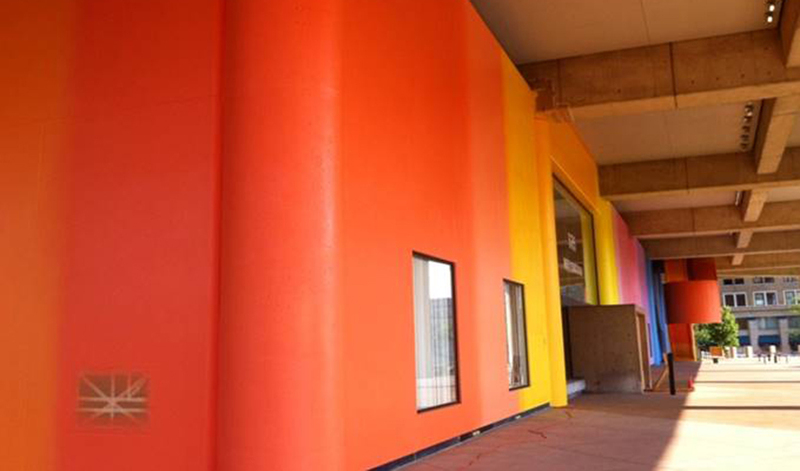 The 2012 renovation of Indianapolis’s Minton-Capehart Federal Building restored Milton Glaser’s Color Fuses mural to the original specification, with 35 blended bands of vibrant color and moving light that simulates the rise and fall of the sun. (Photo courtesy of the U.S. General Services Administration). GSA hired North Carolina-based conservator Martin Radecki, former chief conservator at the Indianapolis Museum of Art, to identify the mural’s original colors, painting sample cards presented to Glaser at his New York studio for approval. Glaser confirmed all but one color was correct. 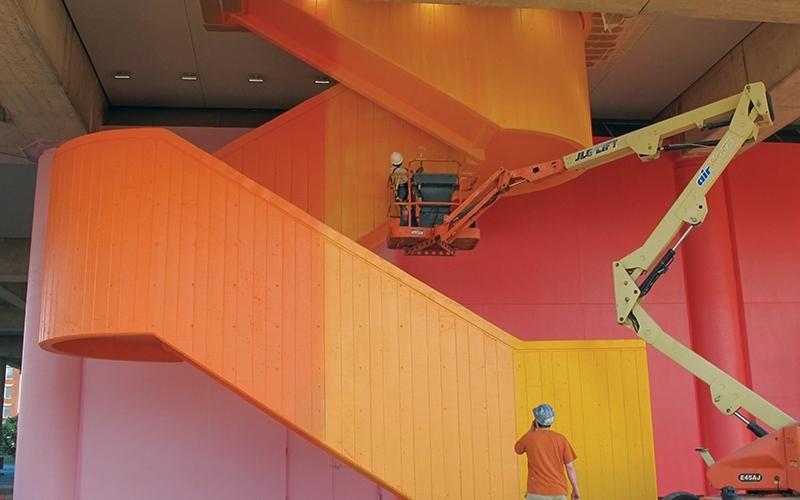 Using a scissor lift and working at night when the building was closed, Thomas Moore Studios painted the prescribed bands of color, with one worker operating the lift while another used a spray paint gun to create the feathering technique between colors. It took an hour-and-a-half to set up the equipment each night, and an hour-and-a-half to take it down, with workers facing challenging lighting and weather conditions. Morning inspections verified that each night’s work held up in daylight. 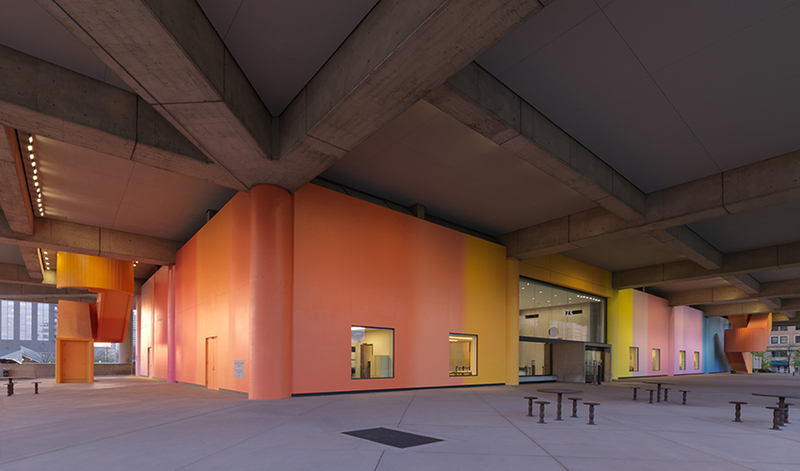 A computer-controlled system of energy-efficient LED lights illuminates Color Fuses, mimicking the gradual movement of the sun as Glaser envisioned. “Redoing meant making it what it was intended to be. And then, of course, it became something totally different than what had first appeared. It became what I had imagined it might be,” observed Glaser in a 2013 video documenting the project. See a short video on the conservation of Color Fuses below.